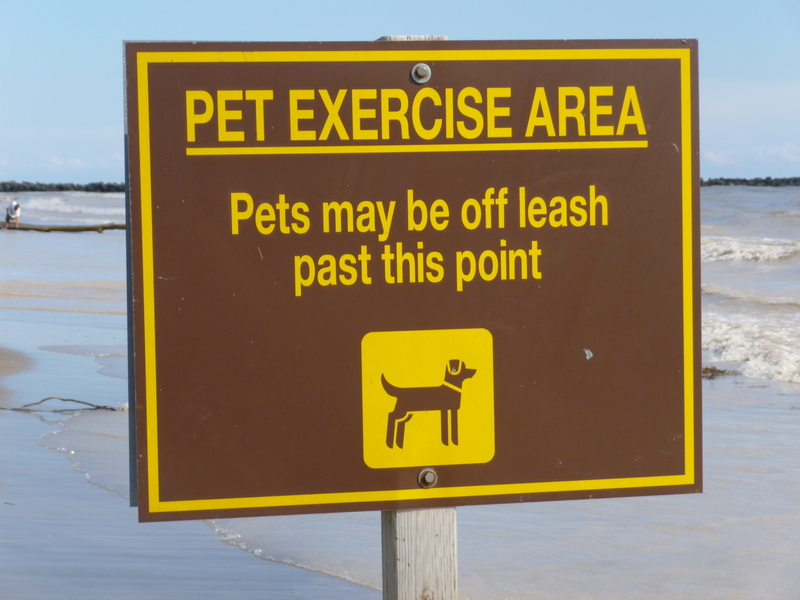 Travel, Port Burwell, Ontario: Leash Free Dog Beach. Hurray! We have a winner! So far, Port Burwell Provincial Park is my favorite conservation area dog beach. 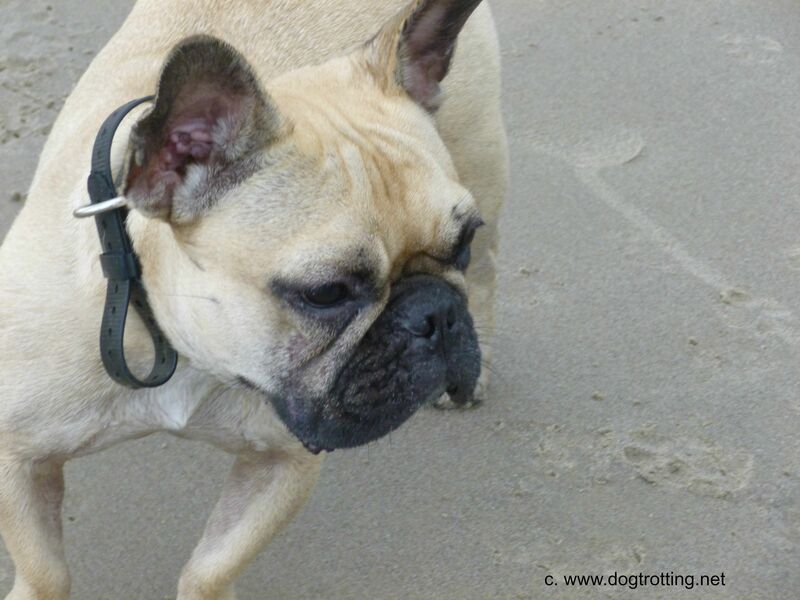 A free-run dog beach – imagine! Some people who live in other provinces (or likely states) might not understand my excitement. I live in the land of regulations (Ontario, Canada), where about one in ten people remind strangers about leash laws; where it’s illegal to take dogs to outdoor patios because of ‘health regulations’ (yes, outdoors where birds poop); and where some conservation areas offer ‘exercise’ areas that require dogs to remain on leashes. What is an ‘exercise area’ at an Ontario provincial park is a little vague, maybe intentionally so. 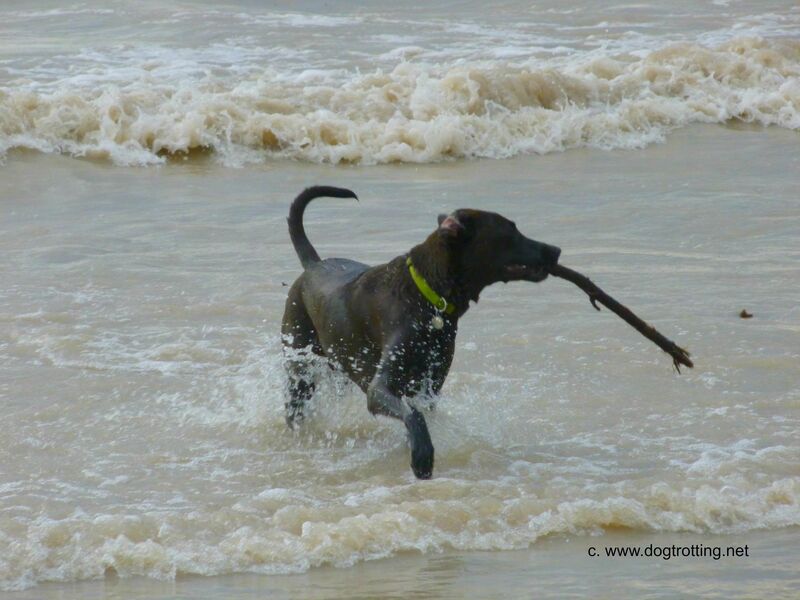 The term ‘leash-free’ is not used on the website, yet pictures of free running dogs are. When I asked parks representatives, I was told that whether dog exercise areas are leash-free is up to individual park wardens who monitor situations daily. 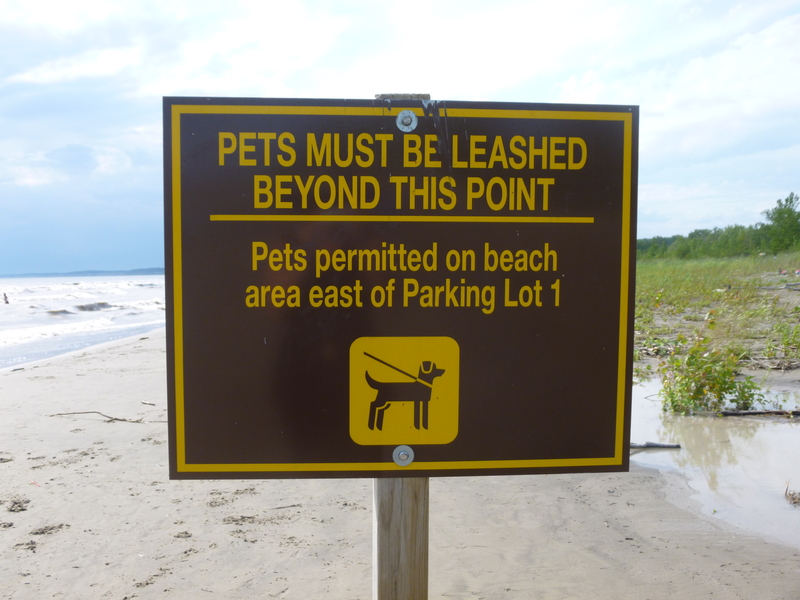 But at Port Burwell, posted signs make it clear: Day use parking lot #1 is the entrance to the dog beach – that’s one side of the 2.5 kilometre soft sand beach on the North shore of Lake Erie. The beach in general is the feature of this park that’s flanked by 20-metre high bluffs on one end and a distant wind turbine farm at the other. Half the dog beach is for leashed dogs and the other end (a notable walk from the parking lot) is leash-free. This is where dogs can be dogs – they run through the sand and waves, either chasing each other or sticks thrown into the cool shallow lake water. If you’re like my schnoodle, Victor, you venture into the water to get your paws, and maybe tummy, soaked before scampering back to the sand, a little wetter and a lot cooler. If you’re like Sasha, a two-year-old lab cross, you lunge into the water like it’s your second home and fight the waves to recover sticks tossed far from the shore … so far your elk-like legs have to swim hard against the tow, again and again. The day we were at the Port Burwell Provincial Park – August civic holiday – the park was popular, but not crowded. A storm the night before had flooded the beach with puddles. High winds continued to throw up debris, creating muddy ocean-like waves along the lake’s shore. (We were warned at the gate). The water was cool and rough, but most dogs dove in unfazed and excited – there were too many friends to meet and too many smells to sniff. Similar to other provincial parks run by Ontario Parks, Port Burwell has campsites – 232 in total, 123 with electricity. Also, if big boy-scout jamboree style functions are in your future, two group sites can accommodate between 20 and 100 people. There are two easy hiking trails: the first, a one-kilometer hike through the ravine and woodlots, and the second, a two-kilometre beach walk. But the oddity that defines the town of Port Burwell – and I had no idea until I stumbled on it – is the real submarine parked a few kilometres from the conservation area. Yes, in 2012 the town bought the HMSC Ojibwa, Canada’s first Cold War submarine that patrolled the country’s coastline looking for Russian nuclear submarines. It’s the first, and largest, artifact in what’s now Elgin County’s Museum of Navel History, and interior tours start at $20 per person. This visit we didn’t go in – no surprise, the dogs can’t go near the Naval History Museum. So we spent the entire day at the beach until dark clouds rolled in, and an eventually cranky Victor growled at a French Bulldog puppy. That’s when we knew it was time to head home – after one drive-by peak at that submarine, of course. If you liked this post, you’ll love others about our adventures on Bying Island in Dunville, Ontario and at Parks Canada properties in The 1000 Islands. Travel Stuff: Here’s one thing I wish I’d had for Victor (a black schnoodle) on the beach – a portable pet shade shelter outdoor dog tent. Also, what’s cuter on a dog beach than your own dog crazy beach towel? So well written! Absolutely enjoyed reading this article! Nice post, Sherri. We were thrilled to see a group of dogs playing at the very southern tip of Winnipeg Beach on Lake Winnipeg in Manitoba. They’re not allowed on the main beach, but are welcome at this more secluded ‘unsupervised’ portion of the beach. ← Dog-friendly Travel: You took your dog where?! ?